THE SPIRIT OF REVEREND BARBER AND MORAL MONDAYS COMES TO L.A.
On Wednesday night there was a massive gathering from communities all over Los Angeles at the McCarthy Memorial Christian Church on West Adams in the Crenshaw District. Regrettably, I don't think this event will get much coverage in the mainstream media that will either under report it or not report it at all. 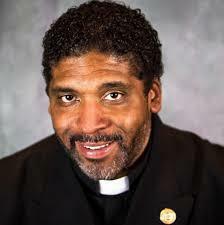 The purpose of the meeting was to bring the Poor People's Campaign to Los Angeles in much the same way that Reverend Dr. William J. Barber II and other have already brought it to North Carolina and elsewhere in the country in a vibrant movement starting to confront and turn around a clearly anti-democratic conservative agenda in this country that has been literally depriving both poor minorities- be they White, Black, Latino or a myriad of others- of their fundamental rights to Life, Liberty, and the Pursuit of Happiness. What Barber and the others that spoke talked about was a clearly more viable alternative to the present minor rules reality that would allow folks to function in a manner that would allow them to not only thrive and fulfill their potential, but would also finally fulfill the potential of this country, which if one is honest with themselves is now in mortal danger, unless we all get involved right away to bring about the radically change we all know in our hearts is necessary. This national call for a moral revival across the country has already overcome the carefully nurtured apathy in North Carolina and elsewhere that came from Barber's realization that good people of whatever their strip are in the majority, no matter what they have been conned into believing otherwise. It has only been their apathy nurtured by corporate dominated media that has allowed a totalitarian bent minority to rule...with the help of unlimited funds still available because of yet legal Citizens United. 1. Are you willing to take direct action including civil disobedience? 2. Are you willing to mobilize your community (faith, organization, school, union, etc.? 3. Are you willing to make a financial donation to support the Campaign? 4. How about using social media to publicize the Campaign? 5. Not sure yet? Why not just sign up to receive text messages with updates about the Campaign that will give you the option to get involved in the future? ‹ HURRICANE HARVEY- A GOOD THING?